When you're looking for affordable, yet stylish window treatments for your space, choose blinds. At Blind Ideas in Glendale, Arizona, we offer a wide variety of blinds for homes, businesses, and multifamily housing. Our selection ranges from popular mini blinds to more contemporary wood blinds. Whichever style you choose, you're guaranteed a flattering, budget-friendly window covering for your space. Mini blinds (Venetian blinds) offer the most cost-effective window treatment solution for sensitive budgets. Durability, pleasing aesthetics, and the ability to fit most anywhere makes them a product of choice. Mini blinds come in a variety of colors, finishes, and price points. Blind Ideas will assist you in finding the product that is perfect for your project. Aluminum mini blinds are engineered using static- and crease-resistant aluminum slats designed to spring back if pulled out of shape. Steel head and bottom rails provide maximum support. 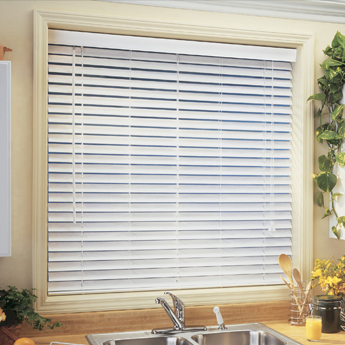 The 1" aluminum mini blinds offer a durable, economic option for your windows. Beautiful 2" faux wood blinds offer the warm look of wood at an affordable price and are a great option where water is present. The 2" faux wood blinds are engineered using a unique steel headrail and the blind slats are made of a static- and fade-resistant synthetic material that won't crack, split, or warp. The elegance, low maintenance, and affordability of our 2" faux wood blinds make it the perfect complement to any window. If you are budget-conscious, 2" vinyl- plus blinds are made with a durable metal headrail and have easy-to-clean, static-resistant slats. The 3-1/2" vertical blinds are designed for durability. The strong vertical louvers are made of fade- and static-resistant PVC. The durable aluminum headrail with self-aligning carriers provides an effortless louver-operating system. The child-safe wand control allows for easy regulation of light or privacy and with left- or right-stack options, their opening and closure can comfortably fit any space. Cord, chain, and center-open options are also available. 2" vertical louvers where desired are offered for multifamily housing. Wood blinds add warmth and beauty. These distinctive wood window treatments are custom-crafted for quality and style, and are carefully engineered to provide privacy, light control, and energy efficiency. 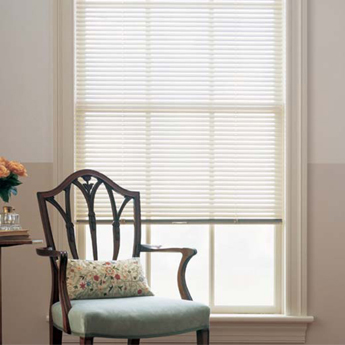 Wood blind slat styles range from 1" slats to the extra-large 2-3/8" beveled shutter slat. Your choice of slat size, routless slats, and cloth-tape options in a variety of unique colors and finishes - including bamboo - provides the perfect energy-efficient look you're looking for. 2" horizontal blinds are the choice for those who want an attractive, designer look.